Find 5 minute updates of the match below. 5m – The first shot on goal came from Augustine Tagana in the third minute who was set up with a layback from John Feraka. Marist Fire are looking like the stronger side in the opening minutes as they controlled more of the ball and Hana are forced back into their own area. 10m – Marist Fire continued their dominance and were unfortunate to get a corner kick scored in the 9th minute when Fredrick Dola found Gabriel Kavere in the box but the defender headed the ball wide. Hana are not able to attack convincingly but and their best so far was Trevor Suinao’s long ranger which was hopeful at best. 15m – Hana have come into the game strongly after their unsure start. Marist Fire defenders are being forced into back deep as the flow of attack from Hana gathers intensity. So far Hana have not been able to get a clear shot at goal. 20m – Marist got another clear scoring opportunity in a one on one with the goalkeeper by Richard Tolinao but his shot was saved. On the other side of the park Dickson Ramo was caught offside chasing a long pass which would have put him clear had he not run too early. 25m – Hana are gained good possession after consolidating their strength in the last 5 minutes. Two more chances to score fell to Hana but Moussa Kourouma and Ramo were both denied by Navusu Kitu. 30m – The match levelled out a bit and both sides struggled for control. Hana managed to drive more passes inside the Marist Fire 18 yard box but the required finishing did not happen for them. 35m – Both sides lost possession easily and really need to slow down the pace of the game. Marist Fire’s goalkeeper did well by supporting his defenders as an extra outfield player but up front is where things are not happening. Dola wasted a good chance when he caught with Feraka’s pass but sent his shot too high. The frustration from the Marist Fire bench is vocal as their coach tried to get his players to control their game. 40m – Both teams had their moments but finishing is not at its best. Marist Fire’s Tagana tried a long ranger but the ball was too high and Kourouma was unable to finish for Hana after a fine move into the penalty area. 45m – Halftime is signalled. Both Marist Fire and Hana failed to make use of the little opportunities they had in the first half. The midfield players did not connect well with the forwards and this resulted in passes being made too late. The second half kicks off. 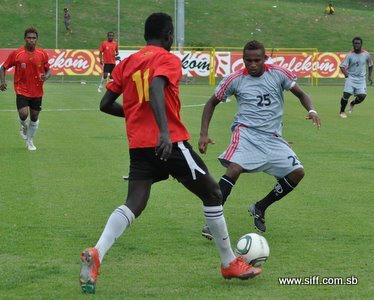 Marist Fire have replaced their first choice goalkeeper, Navusu Kitu, with Philip Mango. 50m Marist Fire have started the second with more composure and have exerted better control in the midfield. However, Hana stole a moment to get a good cross in for Jeffery Henry whose point blank header was beaten back by Mango in the forty-ninth minute. Marist Fire are trying to open up the game by pulling wide every moment they had the ball but Hana have been able to stifle their efforts. 55m – Marist Fire continued their possession but no goals have come for them yet. Dola did well on the sidelines getting passes through to his strikers but Hana have removed Godwin Bebeu in favour of the quicker Tony Otini as they tried for faster game. 60m – Hana started slowly this half and have been fortunate Marist Fire have not set them back by any goals. Otini struggled to make an impact but redeemed himself when he volleyed just wide in the 68th minute. Marist Fire’s Lency Saeni had to be removed for treatment after clashing with Otini after the shot and returned into the field after almost 2 minutes out. 65m – Mango stole the limelight for a moment when he blocked multiple shots coming from the now rampant Hana forwards. Henry tried twice and Ramo was also involved but Mango stood his ground and denied both of them. On the counter attack Marist Fire found space and numbers on the right but the final pass was not good enough and Hana escape. 67m – GOAL Hana 1 – Marist Fire 0: Trevor Suinao puts Hana in front with a curling shot taken from the left. The move was started by Remarx Kwaria who crossed the ball from the right and Otini smartly allowed the ball to go to Suinao who was in a better position. 75m – Marist Fire had an excellent opportunity to score go to waste when Richard Tolinao puts his shot to the post after one-on-one with the Hana goalkeeper. 79m – GOAL Hana 1 – Marist Fire 1: Richard Tolinao makes ammends for his earlier blunder by getting it right this time from a similar situation. He was put free with a through ball and his shot curved around the goalkeeper and into the back of the net to level the scores. 80m – Instead of taking advantage of their goal Hana have slowed down their game and Marist Fire have put them under pressure for this. 82m – GOAL Marist Fire 2 – Hana 1: Henry To’o shows excellent control before blasting the ball into the back of the net after a long pass found him free on the far side. 85m – Marist Fire have taken control of the game after their second goal. The best from Hana was a free kick taken by Joe Manu but Mango was up to challenge. 90m – Stoppage time of 3 minutes is signalled. 90m + 2m – GOAL Marist Fire 2 – Hana 2: Moussa Kourouma equalises for Hana with a shot from outside the penalty box. 90m + 3m – GOAL Hana 3 – Marist Fire 2: Remarx Kwaria gives the winner to Hana with a thundering shot after spotting a loose ball outside the Marist Fire 6-yard box.